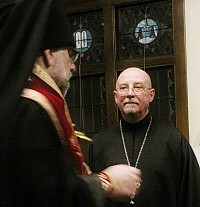 Archpriest Ken James Stavrevsky celebrated the 35th Anniversary of his Ordination to the Holy Priesthood on Monday, 16 December 2013. An evening service of thanksgiving was celebrated by Bishop Michael at Saint John the Baptist Church in Rochester NY where Father Ken and Matushka Natalie have been assigned since 2004, after a 20-year career in the United States Air Force Chaplain Service. A social reception followed the service, during which the "parish band" (Elaine Abbott, leader and keyboard; Jan VanDuyn, harp; Nicole Platte, bassoon; Andrea Fedoruk, percussion; Natalie Stavrevsky, flute; Tom Gervais, manager and vocalist) inspired those gathered in singing familiar Christmas carols. The parish presented His Grace with a contribution of $1,000 to the Distinguished Diocesan Benefactors initiative in honor of the celebration. 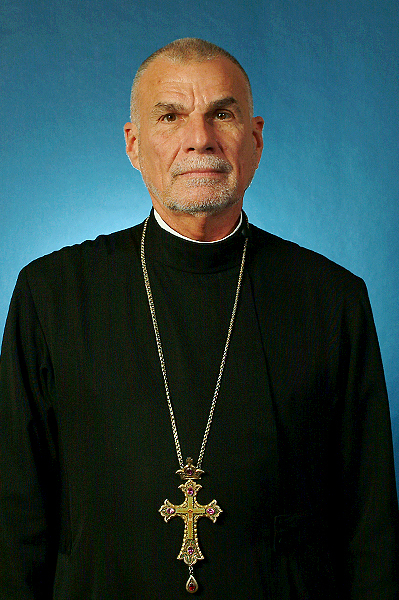 Archpriest George Hasenecz celebrated his Golden Anniversary of Ordination to the Holy Priesthood on Sunday, 8 December 2013. He was ordained exactly 50 years ago that day (it was also a Sunday) by His Eminence, Archbishop (then Bishop) Kiprian of Philadelphia. The milestone was marked by a Hierarchical Liturgy celebrated by His Grace, Bishop Michael, in Holy Trinity Church in Randolph NJ where Father George served as rector from 1965 until his retirement in 2009. On behalf of His Beatitude, Metropolitan Tikhon, and the Holy Synod of Bishops of the Orthodox Church in America, Bishop Michael presented Father George with a Synodal Gramota in recognition of his half-century of dedicated service to Christ and His Holy Church. A banquet honoring the jubilarian followed the divine services with more than 200 clergy and faithful present.